Housing Perspectives (from the Harvard Joint Center for Housing Studies): Are Renters Less Energy Efficient than Homeowners? Are Renters Less Energy Efficient than Homeowners? According to data from the Energy Information Administration, American renters use nearly a third more energy per square foot than homeowners. What accounts for this difference? In part it’s because rental units are typically smaller, and are therefore more energy intensive. For example, a family in a small apartment needs a refrigerator, stove, and water heater the same way a family in a larger apartment (or a homeowner) does. These things require a basic amount of energy, regardless of square footage. Rental units also tend to be older; 75 percent of renters live in units built before 1990 while 68 percent of owners live in older units. Source: US Department of Energy, Energy Information Administration, 2009 Residential Energy Consumption Survey. That said, the above chart shows that the amount of energy used by renters can vary depending on whether their utility costs are fixed (built into their rent) or if they pay for utilities themselves. 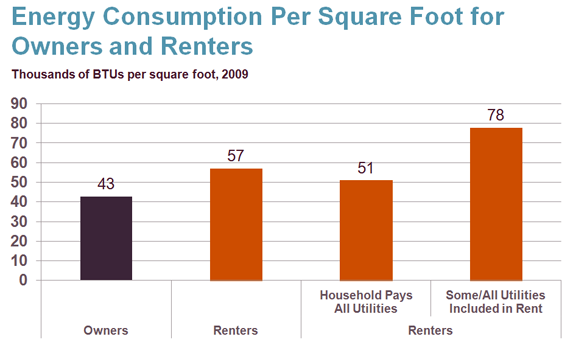 As the chart illustrates, renters consume considerably more energy when some or all of their utility costs are fixed. This shows the general tendency of people to consume more of something when there is no added cost for doing so. Such excess energy consumption drives up the amount of energy renters use overall, further accounting for the efficiency gap between owners and renters. 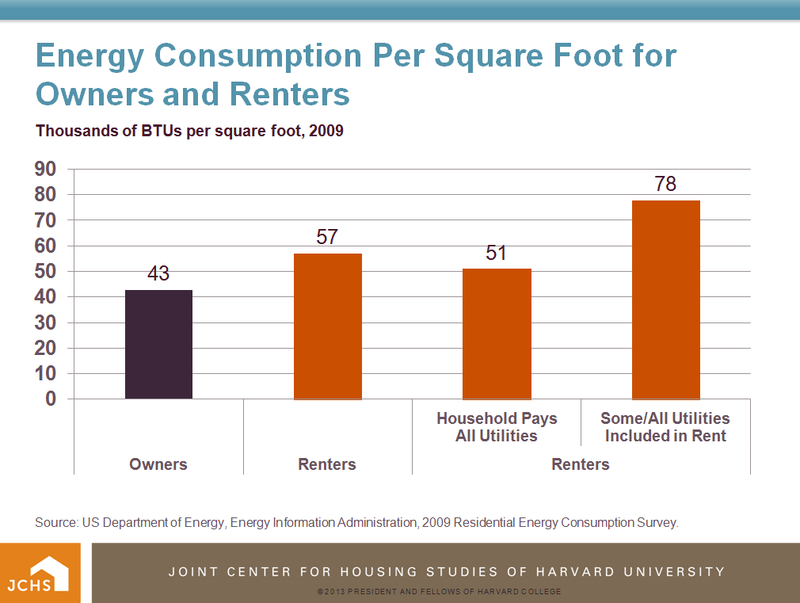 Even so, renters who pay for utilities separate from their rent still use slightly more energy per square foot than owners. This suggests a real, structural efficiency gap between rental and owner units. In fact, a recent study found that multifamily rentals in 2009 had 34% fewer energy efficiency features on average than other housing types. Consumer fuels and utility costs have risen over 50 percent over the past decade, outstripping overall inflation, which makes energy efficiency improvements (insulation, energy efficient windows, compact fluorescent lighting, HVAC upgrades, energy efficient appliances) appealing to people wanting to lower their energy bills. But when tenants pay for their metered energy usage, a property owner’s incentive to perform energy efficiency retrofits is lower, since any cost savings will benefit the tenants, not the owner. Rental property managers also have less control over how their tenants respond to an energy retrofit (e.g. more efficient windows might still be left open in the winter). These things can keep rental property owners from performing energy efficiency retrofits at the same rate as homeowners which, in turn, keeps energy usage by renters high. The gap in energy usage between owners and renters suggests that there are real opportunities for savings through some combination of added incentives for property owners to make these investments in retrofits and greater incentives for tenants to conserve energy. Lowering energy use would have the additional benefit of bringing down the cost of rental housing at a time when more renters are paying very high shares of their incomes for housing as a new study by the National Low Income Housing Coalition shows. It seems to me that energy per person would be a better thing to measure. Two people in a 1000 sf apartment are going to use just as much energy to heat water, dry clothes, ... as 2 people in a 3000 sqft home.